AMC’s The Walking Dead season eight episode 15 begins with Rick (Andrew Lincoln) reading his letter from Carl. Carl recalls happy memories from school, going to the movies, Friday night pizzas, and all the ordinary things that went on back when life was normal. He remembers feeling safe when his dad held his hand and how he figured out that growing up means making those you love feel safe. Carl confesses he wanted to kill Negan and that he doesn’t think the Saviors will surrender. But, he also notes that he believes his dad doesn’t want those ordinary people to die just because they’re with Negan for now. He wants his dad to make peace with Negan and find a way to move forward. Most of all, Carl wants his dad to show others that life can go back to normal at some point. They just have to keep trying and not give up their humanity. Michonne (Danai Gurira) takes the letter Carl wrote to Negan out of the drawer. Gregory (Xander Berkeley) has a heart-to-heart with Simon (Steven Ogg), and Simon’s definitely not pleased with the former leader of The Hilltop. Gregory wants to make it up to Negan, but Simon informs him he’s assumed control of the Saviors. They toast to Simon’s new position, unaware Negan’s arrived back at the complex. Despite their mutual appreciation of Simon’s new power, Simon doesn’t forgive Gregory and needs to make an example of him. Gregory, of course, insists he’s still an important player and isn’t done. Simon decides not to kill him and instead takes him on as a coffee boy. The Oceanside people are wandering the forest when Aaron (Ross Marquand) kills a walker about to attack them. They’re not sympathetic to Aaron and barely speak as they pass by him. 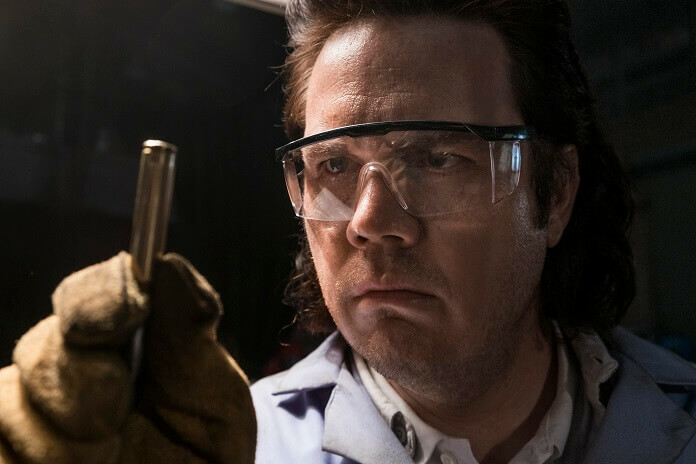 Eugene (Josh McDermitt) whips up a batch of Mac and Cheese, delivering a lengthy explanation as to how he makes it. He tells his cooks to make it for all the workers. He then tells all his workers they need to speed up, as commanded by Simon. He admits he’s aware they won’t be able to make Simon’s quota, but they have to try their best. Gabriel (Seth Gilliam) is still ill and Eugene goes off on him for raising his mask. He doesn’t want Gabriel to spread his disease or to get more ill. Gabriel reveals he’s having a hard time making bullets that will kill his people, however he also doesn’t want to die. He thinks his predicament is God’s way of showing him he’s still the same scared animal who locked out his parishioners. Eugene kicks him off the assembly line. 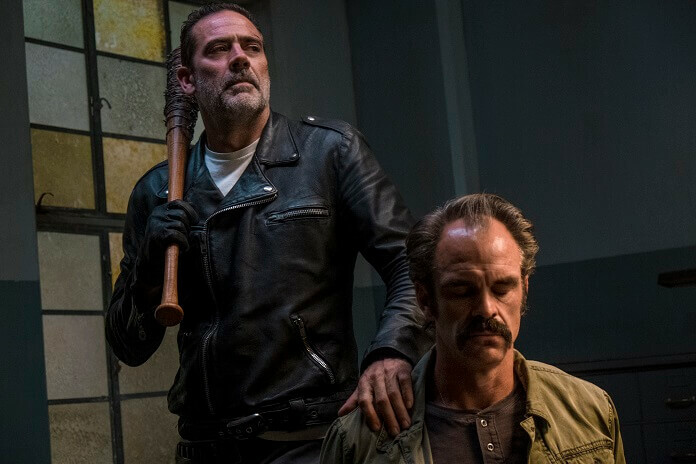 Negan (Jeffrey Dean Morgan) is back, with Lucille, and Dwight (Austin Amelio) is understandably shocked. Negan asks what he was thinking when he didn’t rescue him from Rick. Dwight blames it on Simon, saying Simon was calling the shots. Negan warns Dwight he wants him to remember this little talk when the time comes. He wants Dwight to think about what they’ve done and what they can still do together. Negan has a talk with Simon, and Simon admits he lacks discipline. He also admits he moved things to extermination at the Hilltop, promising to make it up to Negan. Negan smiles and recalls when he initially took control of the compound. Negan also recalls Simon killed a lot of boys and men before the Saviors jelled as a group. Simon appeared to be a crazed killer, but Negan kept him on anyway. Negan commands Simon to get on his knees in front of the half-dozen other Saviors in the room. Simon doesn’t make a move against Negan and Negan tells him he’s forgiven. He allows Simon to live and says they’re good. Simon promises he won’t let Negan down again. Negan points out a new staging post on a map. The outpost will make it so that the Hilltop can’t leave their complex to get supplies. The Saviors will set up multiple outposts and multiple teams outside Hilltop, picking off anyone who steps outside the walls. After the group leaves, Negan has Dwight stay behind. Negan’s impressed Dwight has always kept his eyes on the prize – no matter what. He advises Dwight to continue to do so. Eugene keeps up a steady stream of conversation with Rosita and Daryl and finally Daryl has enough and threatens to cut his tongue out. They’re walking and need to keep ahead of the Saviors who should be looking for Eugene by now. Eugene starts talking again, recalling how he thought he’d be tortured or killed by the Saviors but they let him live. Rosita tells him every single person who’s died is on him. Eugene blames everything on Rick, but Rosita will have none of it. She calls him a coward and a traitor who turned his back on his only friends. She also warns him they’re going to stick him in a dark room and only pull him out when they need to use his brain. Dwight copies the map with the outpost locations. He’s interrupted by Simon knocking on his door and is able to put the map away before he lets Simon in. Simon wants to organize other Saviors against Negan, and he wants Dwight to help gather like-minded Saviors to make their move. Simon reminds him of everything Negan has done to him and sets up a meeting in the courtyard after rounds. Dwight reluctantly agrees. As they near their car, Daryl has to take on a herd of walkers while Rosita watches over Eugene. Eugene makes himself throw up and as Rosita reacts, he runs away. Aaron’s in bad shape in the forest and doesn’t have any food. Fortunately, it’s raining and he’s able to collect clean water. Unfortunately, he’s by himself and on constant walker alert. He hears growls and the fight for his life begins. He’s weak and killing them in hand-to-hand combat takes a lot of energy. He drops his knife as more walkers arrive and surround him. He unsuccessfully searches for it in the leaves and then is forced to use a stick to hold them off. He stakes one through the head and manages to beat another one to death. Aaron passes out in the mud, surrounded by now really dead walkers. The Oceanside crew find him that way and he comes to enough to explain the Saviors are responsible for everything. They don’t trust, they hide…it’s all because of the Saviors. The Oceanside group needs to fight or else hiding out is their life forever. Simon says next up will be the destruction of the Hilltop, after they set things straight with the Saviors. Negan arrives from around the side of the nearby trash container. Dwight told Negan what was happening, and Negan has his own loyal people kill everyone at the meeting except for Simon, Gregory, and, of course, Dwight. Simon can’t believe Dwight sold him out. The Saviors gather inside the main building. Simon tells the group that he didn’t want this, but he believes it’s the only way for the Sanctuary to continue to exist and flourish. He gets in the first two hits on Negan but then it becomes a pretty even fight. There’s a lot of fists flying and grunting going on before Negan slams Simon to the ground. While no one’s looking, Dwight sends Gregory off with the outpost map to give to Rick. Negan holds Simon by the throat and is furious that now he must kill the Hilltop people or else they’ll always be looking for ways to push back. After Simon’s dead, Negan calls him an a**hole. Back at the Hilltop, Gregory’s locked up in the prisoner’s pen again. Rick gets the note from Dwight and he, Michonne, and Maggie (Lauren Cohan) have to decide what to do. Negan and Dwight talk and walk, and Negan’s happy he has always been able to count on Dwight. He makes him his new right-hand man, and Dwight’s honored. However, it’s all been a setup. The outpost map was a fake. Negan knew what Dwight was up to and when Dwight opens the door to his room, he’s surrounded by Saviors. Dwight’s stunned to see Laura, who he assumed was dead, in his room. She describes how Dwight turned on everyone in Alexandra. She’s been waiting to expose him as a weasel, claiming it’s the only thing that kept her alive. Negan reveals he’s aware Dwight’s been passing information to Rick for a while and Negan knows Dwight’s been lying about other things, too. Negan calls him a nothing, a nobody who’s way over his head. Negan describes how he set up the fake outpost plan because he knew Dwight would pass the info to Rick. Negan also knows Gregory delivered the info to Rick, and now Rick and his people will be led directly into the line of fire. Negan explains that killing Dwight is too dignified an end, so he has other plans for him. Eugene returns to the ammunition factory, demanding they set up a perimeter in case they get attacked again. He learns Negan’s back and needs the bullet order by tomorrow to wipe out the Hilltop. Eugene promises the order will be filled on time. He then tells his workers to get busy, giving them a horrible pep talk that includes a declaration they’ll change Savior history. A quick Simon update: He’s now a walker chained to the front gate. Michonne contacts Negan over the walkie-talkie. She explains she’s calling about Carl and his letter, saying she’s delivering the letter because that’s what Carl wanted. She reads it over the walkie and it includes Carl’s explanation of how he got bit. Carl wrote that he doesn’t think Rick has killed Negan and he believes Negan doesn’t think all of Rick’s people are lost causes. He tells Negan the way out is working tougher. He hopes Rick offers him peace and that he takes it. Carl adds that he hopes Negan can start over. Negan replies, “There is no getting out of it now. I wouldn’t accept your surrender if you came to me on your knees.” He goes on to say he wants to kill each and every one of them. That’s the only way this ends. He tells Michonne to pass on that message to Rick and then smashes the walkie-talkie.